My “breaker stage” tomato-picking experiment is progressing nicely and I’m learning as I go. I picked four less-than-ripe tomatoes last Monday (July 25) just before arrival of showers that I thought might cause the fruit to split. I took the tomatoes inside and let them continue ripening on our kitchen counter until Friday (July 29). Photo 1 shows the four tomatoes when I picked them on July 25. Back row: Brandywine Red, Brandywine (Sudduth’s Strain), and Virginia Sweets. Front row: Big Mama and a common cherry tomato, Sungold. I added the Sungold to give an idea of the comparative sizes of the fruit. The Sungold within a day disappeared in a sudden gnashing of my teeth, and the Big Mama surrendered peacefully to a slicing knife on Thursday evening when Ellen and I were making sandwiches. The three biggest tomatoes slowly ripened for four days on our kitchen counter, where the temperature was approximately 78°F. Photo 2 shows them just before we sliced them for lunch on Friday (July 28), and Photo 3 shows slices just a few minutes later. How did they taste? Did they have the exciting flavor of vine-ripened tomatoes—as my earlier posting suggested would be the case? Or were they “off flavor” or even as tasteless as the tomatoes we’re accustomed to bringing home from the supermarket? I was particularly interested in seeing how the Brandywine (Sudduth’s Strain) and the Virginia Sweets, both heirlooms varieties, ripened inside. Over the years I’ve “lost” many of that pink Brandywine because I stubbornly let them hang on their vines while I waited for their color to intensify. I wanted a deep pink, I suppose—but the fruit often cracked and rotted before I decided to pick it. Conventional wisdom says heirloom tomatoes ripen internally before they appear ripe externally. The Virginia Sweets is a new variety for me this year, and I didn’t really know what it would look like when ripe. Its seed packet describes mature fruit as “gold-red bicolors” and “golden yellow beefsteaks … colored with red stripes that turn into a ruby blush.” Just what would that look like out in the garden? So cut and sample we did. All three tasted great. I’ve frequently grown Brandywine (Sudduth’s Stain), and Ellen and I both thought it was as mouth watering as one ripened on the vine. The Brandywine Red tasted nearly as good as the Sudduth’s Stain, but was “juicier” and not as solid as the Sudduth’s. The meat of the Virginia Sweets was mostly yellow, but it tasted more like a red tomato than a bland “low-acid” yellow. However, I’ve learned a few things during this experiment. First, I’ll pick tomatoes even earlier—when they’re just beginning to add color and before they are “nearly ripe” or show any signs of cracking or other problems. The Brandywine Red was almost too ripe by the time I sliced it. The Sudduth’s Brandywine had begun to crack on the fine, and the crack widened as it ripened in the kitchen, so I had to dispose of more of the “meat” that I wanted to eat. Second, I will start slicing heirlooms, such as the Brandywines, before they look absolutely ripe on the outside. I’ve accepted the conventional wisdom that they are ripe inside before they look ripe. Sungold, not large enough to accurately weigh. Brandywine Red, 15 ounces (425 g). Brandywine (Sudduth’s Strain), 1 lb 1 oz (480 g). Virginia Sweets, 1 lb 9 oz (800 g). Yes, that is one large tomato, impressive even while hanging on the vine. Have you picked tomatoes before they were fully ripe? If you have, please post a Comment about how picking at breaker stage works for you and how you think the ripened fruit tastes. Does it taste as good as vine-ripened fruit? 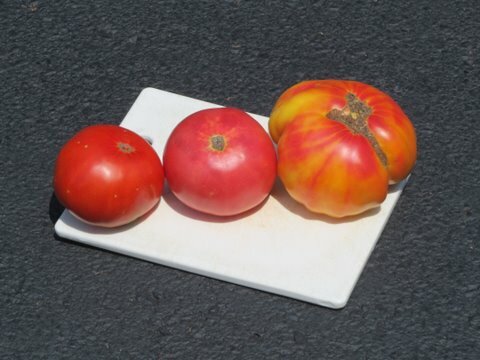 And if you grow heirlooms, share a tip about how you tell when they’re ripe? Grow it. Experiment. Eat it. Comment. P.S. If you didn’t read my earlier posting about picking tomatoes at breaker stage and want more information, CLICK HERE. I think you are correct. 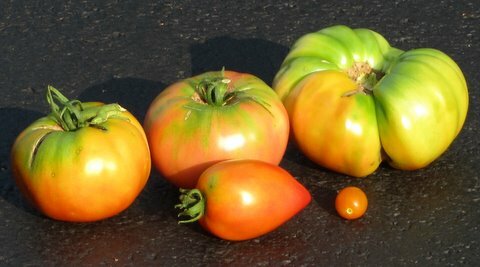 We definately found that we must harvest the heirlooms before the change color all the way. If not there is splitting and they start to rot. Glad to read that the flavor is just as good when finished on the kitchen counter. We too did brandywines, but the best heirloom producer for us has been the Italian Heirloom from seed savers exchange. Highly recommend it! I've been following this method as well and it's mostly working – except this morning I reached for two enormous Pineapple tomatoes at what looked like just past breaker stage and — too late already, lots of decaying flesh on the bottom. Well, I got a basketful of other kinds that will ripen on my counter. Bob, I've been picking at breaker stage since I read your post and have not been disappointed. 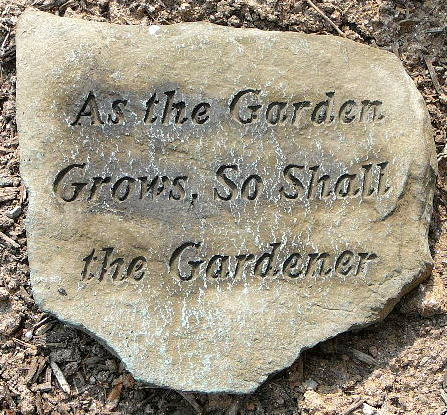 Probably the best gardening advice I have received all year. 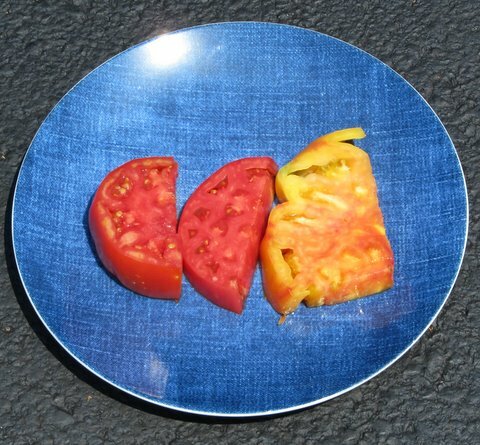 I picked a Sunbrite at breaker stage and let it ripen for 2-3 days then gave it to my neighbor…according to him it was a “perfect” tomato.